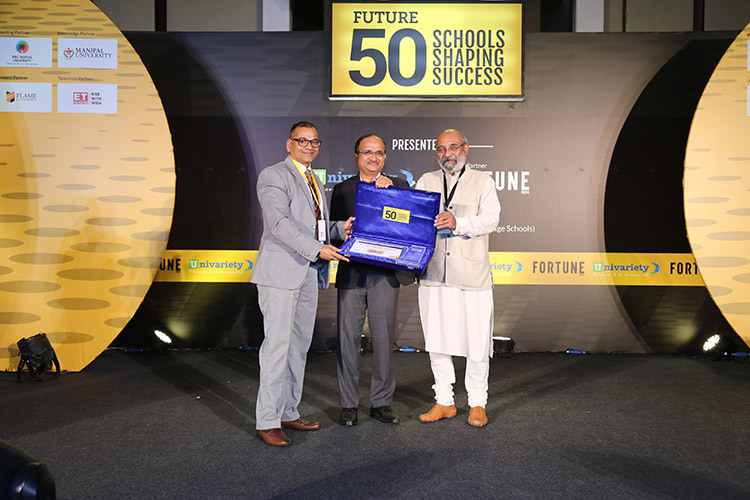 The Sanskaar Valley School has been extended an honour by Future 50 Schools Shaping Success, Fortune India and Univariety, of being rolled in to India's first ever elite club of "Future 50 Schools Shaping Success". In an independent survey conducted by their process partner PWC (PricewaterhouseCoopers), the school was presented a "Certificate of Recognition" by Fortune 500. In a glittering ceremony hosted at The Grand Hotel in New Delhi on the 6th of October 2017, the Director of IIT Delhi Mr. V Ramgopal Rao and eminent Educationist Dr. Sumer Singh extended the award for "Excellence in International Curriculum" to The Sanskaar Valley School. The school has been affiliated to the CIE (Cambridge International Examination) and has been recognised as a forerunner in shaping success of the students. This is for the first time that Fortune India and PWC have joined hands to conduct a comprehensive study of the best practices followed in schools. More than 250 schools that have demonstrated strong vision and result for the future of their students were meticulously surveyed on indicators based on various performance criteria. Only the chosen 50 in the National and International Curricula were recognised as the change-makers, the trendsetters and the innovators.